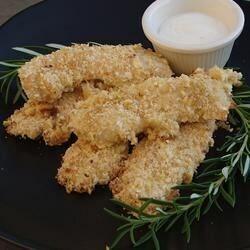 "Chicken strips dipped in a mayonnaise/mustard mixture, then a sesame seed/cracker crumb mixture and baked. Served with a honey mayonnaise dipping sauce. These chicken strips are very tasty, especially when dipped in the sweet sauce. These go over well at summer get-togethers and make great finger foods." I made it with nonfat yougurt in place of the mayo to reduce the fat content, and it was good. My kids loved it. Everyone raved about these chx strips, and the kids -- 3 & 5 -- loved them. Add some of your favorite mustard (we used ballpark) to provide a little kick to the dipping sauce. delicious chix recipe,my baby loved them! I made this for a dinner party and everyone liked it. I think the dipping sauce is a little too rich, though.